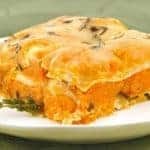 A delicious, meatless lasagna made with roasted butternut squash, creamy goat cheese, sage and thyme. Preheat the oven to 375°F. Scrub and peel the butternut squash, cut them in half lengthwise, scoop out the seeds and cut crosswise into 1-inch thick slices. Arrange the squash in a single layer on shallow baking pans that have been coated with nonstick spray. Bake for 20 to 25 minutes, until the squash is very tender when pierced with a knife. Allow to cool. While the squash cools, heat the butter in a skillet over medium heat. Add the onion and sauté until translucent, 3 to 4 minutes. Add the garlic and continue cooking until fragrant, 2 minutes longer. Remove from the heat and stir in the sage. Cut 1/2 of the squash into 3/4-inch cubes and add to the butter-onion mixture. Season with salt and pepper and toss to combine well. Set aside. To make the sauce, place the remaining squash in a large mixing bowl and mash with a fork. Add the half-and-half, chicken broth, parmesan cheese and thyme leaves. Season with salt and pepper. Using a hand-held blender (or a regular blender), purée the mixture until smooth and silky and set aside. In a medium mixing bowl, combine the ricotta cheese, goat cheese, egg and parsley. Stir until smooth and season with salt and pepper. To assemble the lasagna, generously butter a 9 x 13 x 2-inch baking dish. Spoon a thin layer of sauce into the bottom of the prepared dish and add a layer of noodles. Top with half of the squash-onion mixture and sprinkle with a little of the mozzarella. Add another layer of noodles and spread half of the ricotta mixture on top. Repeat with remaining noodles and ricotta mixture, reserving a small amount of the mozzarella cheese. Pour the sauce evenly over the layers, being sure to coat the edges of the noodles. Cover tightly with aluminum foil that’s been coated with nonstick spray and bake for 30 minutes. Remove the foil, top with the remaining mozzarella and return to the oven for 10 minutes longer.